Blackfin tuna make up one of the smaller tuna species with a distinctive dark back and white body. They usually have yellow-tipped fins and narrow light yellow bands above their side fins. The average adult measures approximately 40 inches in length and weighs about 45-50 pounds. Blackfins live an average of five years and breed at roughly two years old. Their spawning season is during the summers in open water, typically during the months of June and July. Summers are therefore among the best times of the year for catching good numbers of Blackfins. The Blackfin is native only to the western Atlantic ocean. Anglers can find them living as far north as off the coast of Massachusetts and as far south as the coast of Brazil. This particular tuna species is more comfortable in warmer waters of at least 68 degrees F. Schools of Blackfins hunt in both surface water and deeper ocean, depending on their spawning season and on available food sources. 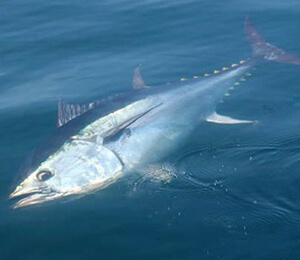 When hunting, they can sometimes mix with schools of skipjack tuna. Their main diets consist of shrimp, small crabs and squid. As with other tuna species, Blackfin tuna are opportunistic feeders and follow the various migration patterns of their natural prey. Depending on their geographic location and available main diet staples, they can hunt in the early mornings, afternoons or at sunset. In the Bahamas and off the coast of Florida, Blackfins hunt and feed mainly in the mornings as well as early afternoons. All fishing parties are to abide by local Bahamian fishing laws and only keep a maximum of six caught tuna species per boat. Any extra fish are to be returned unharmed into the ocean. Freeport charter boats offer fishing tours during the best times for catching Blackfins. Schools of these fish are easiest to find during June and July, but chances of catching a large Blackfin are good right up until the end of September. Hiring a Freeport charter boat comes with the choices of both light tackle and deep sea fishing. Freeport Grand Bahama is one of the most popular spots for chartering fishing boats during the height of Blackfish season. 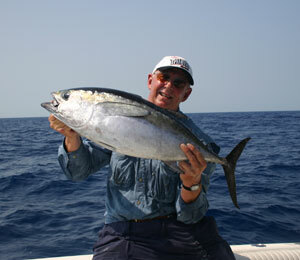 Reservations for Blackfin fishing are recommended, and several boat sizes are available for different fishing expeditions. Due to an excellent location and beautiful year-round weather, anglers who opt for Freeport charter boats have the first tries at schools of Blackfins before the fish have time to migrate far. For newcomers to deep sea or light tackle fishing, experienced captains are also available to help them get started. Blackfins are favorite game fish in the Bahama, and the area provides no shortage of prime fishing spots from early spring to late summer. 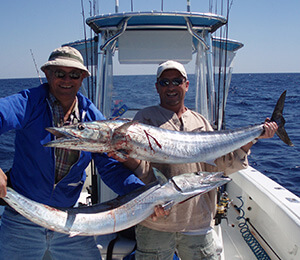 Our fishing guides have years of experience in these local waters and can accommodate anglers of any skill level. To reserve fishing expedition dates, clients are encouraged to contact FishintheBahamas.com via phone or email.